25th Jan. – 9th Mar. 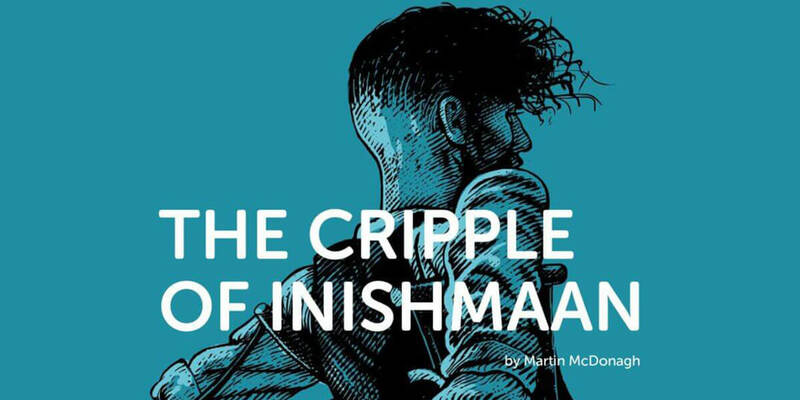 Set on the island of Inishmaan in 1934, Johnnypatteenmike (Phelim Drew) is the local gossip. He makes his living travelling door to door, telling the inhabitants three pieces of news, for which he expects payment! Cripple Billy (Ruairi Heading) has little time for Johnny or his news. He lives with his two ‘Aunts’ who run the local shop. Johnny has just arrived at their door with his latest dispatch. Surprisingly, he does have some interesting news today, as he comes with the tale of a Hollywood movie which is being filmed on the neighbouring island of Inishmore. Immediately, Cripple Billy starts to dream of his escape from the island and of Hollywood. This is a play written by Martin McDonagh in 1996 and it was first performed at the National Theatre in London. It is the first of his Aran Islands Trilogy, which came immediately after his Leenane Trilogy, and long before Martin’s attempts to conquer Hollywood himself, with films such as Three Billboards Outside Ebbing, Missouri. This is a new production by the Gaiety Theatre itself, which is something of a departure for the theatre. The theatre generally relies on travelling productions hiring the space but this time they have produced their own show. To this end, they hired Andrew Flynn of Decadent theatre company to direct the production. The set is very impressive, and the play opens with a representation of a shear rock face along with a craggy beach below. This cliff face opens up to show the inside of a cottage, where the Cripple lives along with his Aunts. This is a very stylish and adaptable stage by Owen MacCarthaigh and Ger Sweeney. This production is obviously trying to emulate the success of the Druid production of the The Beauty Queen of Leenane which ran in the Gaiety in 2016 and received many plaudits. The subject matter and style of this play is quite different from its predecessor, and the story doesn’t have the depth of the Beauty Queen. It is something of a light-hearted comedy, in as much as McDonagh is capable of writing one. The play is largely reliant on the characters and gags as the story is relatively slight. The real joy of this production is the cast. There are several characters that dominate the stage, and a particular highlight are the scenes where both Phelim Drew (Johnnypatteenmike) and Rosaleen Linehan (Mammy) are on stage together. Phelim Drew has a growing reputation and this will only further it, with his portrayal of the dastardly gossip Johnny who spends his days trying to poison his mother through drink! Ruairi Heading also deserves a mention as the Cripple Billy. He has served his time on the smaller stages around Dublin but was confident in his main role. The production certainly is an impressive rendering of the script, despite some small reservations on the play itself. Rosaleen Linehan (The Red Shoes, The Dead, David Copperfield, Woyzeck in Winter) – Mammy.